Whether you’re dating, a newlywed, married for 30 years, or divorced, we will help you create the relationships you want and deserve. 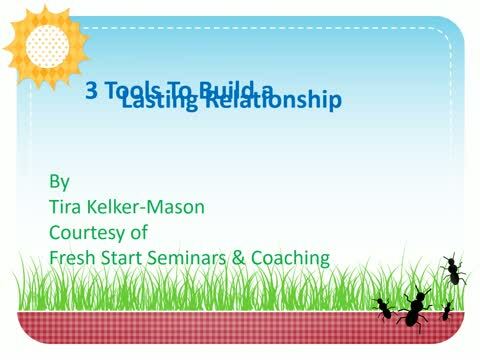 At Fresh Start Seminars & Coaching we work with you to address every relationship in your life. We focus on strengthening families and resolving conflict. Seeking different outcomes is a wonderful sign of growth and we grow from our experiences and those experiences shape how we relate to others. Sometimes relationships have to be reinvented, renewed, & refreshed. Imagine finally accomplishing your relationship goals, reconnecting with your family, or refreshing your dating life. Think of how happy you and you spouse would be to finally resolve martial conflict. Envision a less stressful home life. This investment is worth your peace of mind and happiness. We offer affordable prices and great value! Contact us for a custom made package for you! *Call or Email for "The 3 Building Blocks for Sucessful Relationships Free Consultation"
"3 Tools to Build a Lasting Relationship"